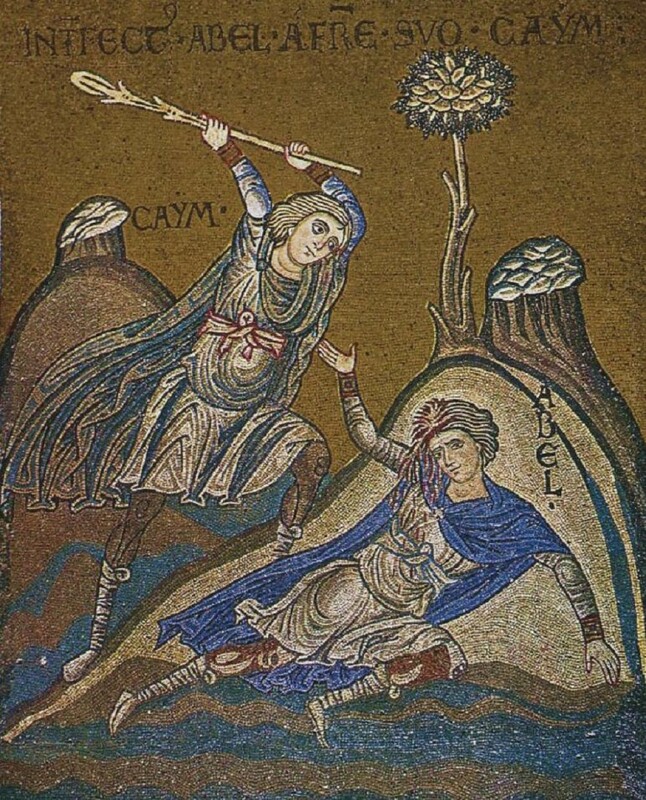 Today’s reading from Genesis 4:8-15 brings to a tragic conclusion the story of Cain and Abel. Murder is murder, it’s a fact of daily life wherever human beings live with other human beings. What is troubling is how the Yahwist, or whoever wrote this part of Genesis, has set it up in a context of religious offerings and God’s response to those offerings. Of course, it is the intent of the Yahwist and everyone else who contributed to the compilation we call the Book of Genesis to describe in mythical terms the origins of every aspect of human existence and experience and to put everything in the context of God’s direct involvement. Fine, that’s what myths do in all cultures and religions; it’s their purpose! But it doesn’t make it easy to accept the goings on in these first chapters of Genesis. We’ve already seen God testing the first humans God created and in a sense setting them up to fail the test. Then we saw God drive out the humans lest they eat from a mythical tree and become like God! Then, for some strange reason God accepted the offering of one brother and not the other and thus caused murderous jealousy to rise up in the rejected brother. What was in the mind of the Yahwist or whoever wrote this story? Now it is true of later Jewish tradition that God claimed for himself the first of every male human or animal. Long lists of animal sacrifices were prescribed. Even grain offerings had to be according to God’s very particular instructions in Leviticus 2. The first fruits are always for the Lord (Lev 2:12); what is left can be eaten by the priests (2:3). The best of every harvest has to be offered to God without delay (Exodus 22:29). These and countless other passages in the Old Testament make clear the importance of animal sacrifices and especially the importance of offering to God the first and best of everything – animals, grains, harvest, etc. But one might protest that Cain didn’t know these rules, they hadn’t been invented yet! That’s not a problem for the Yahwist or whoever wrote the Cain and Abel story. The ultimate purpose of myth is etiological: to carry back into primeval times and origins what we know as everyday occurrence or practice and thus justify the origin of what we do or believe. 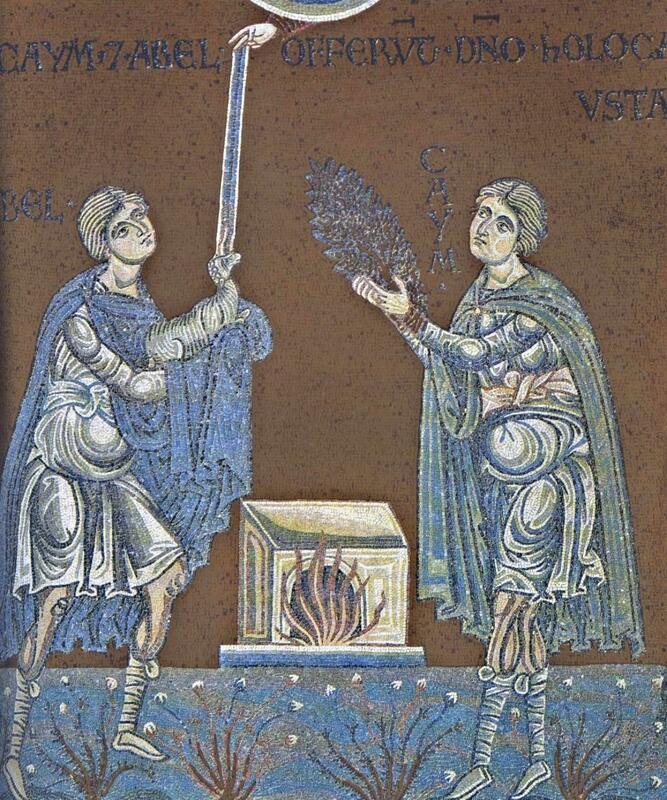 Too bad Abel had to die for doing the right thing, but that’s also part of human experience – the good die young! The etiological function of stories or myths is very similar to the typological interpretation of many scriptural passages. Applying that thought here, Abel’s offering is a type or foreshadow of what would later become normal practice required by God. Thus, Abel did what the Law required without knowing the Law! Romans 2:14-15 “When Gentiles who have not the law do by nature what the law requires, they are a law to themselves, even though they do not have the law. They show that what the law requires is written on their hearts, while their conscience also bears witness and their conflicting thoughts accuse or perhaps excuse them.” Substitute Abel for those Gentiles who do what the Law requires and this is a perfect explanation of what the author probably meant to convey in this story. Paul’s mention of “conflicting thoughts” that accuse or excuse is also a good, non-supernatural explanation for what Cain underwent. As I speculated in my post yesterday, it was his conscience rather than the voice of God that spoke to him. Noah also did what pleased the Lord: Then Noah built an altar to the LORD, and took of every clean animal and of every clean bird, and offered burnt offerings on the altar. And when the LORD smelled the pleasing odor, the LORD said in his heart, “I will never again curse the ground because of man…” (Genesis 8:20-21) But before we get too hung up on the etiological purposes of stories and the importance of animal sacrifices in Jewish tradition, let us not forget that the Jewish tradition had its own way of challenging the importance attached to them. We already read Isaiah’s extraordinary words in the opening chapter of his book: “What to me is the multitude of your sacrifices? says the Lord; I have had enough of burnt offerings of rams and the fat of fed beasts; I do not delight in the blood of bulls, or of lambs, or of he-goats… Bring no more vain offerings; incense is an abomination to me.” And remember, this is God speaking through the mouth of Isaiah. These “curses” are again etiological; they explain daily facts of toil and suffering in the lives of people through primeval imagery. But Cain’s punishment and judgment is from God only. No human will be allowed to take his life – and that is the purpose of the mark. “And the Lord put a mark on Cain, lest any who came upon him should kill him. Then Cain went away from the presence of the LORD, and dwelt in the land of Nod, east of Eden.” Just as Adam was exiled from Eden, his son is now exiled further away, “east of Eden.” Today’s reading from Isaiah also speaks of exile: “Therefore my people go into exile for want of knowledge” (Isaiah 5:13). Sin begets sin, and suffering multiplies. We see in the story of Cain the beginning of what Christian theology will call “original sin.” Cain does not inherit his father’s guilt; but sin has tainted human existence. Without God’s intervention and protection, sin would have multiplied exponentially from the very beginning. God places a “mark” on Cain as protection. Though Cain goes away “from the presence of the Lord,” he will always be within earshot of God. The mark signifies that no matter how great the evil that human beings commit, we are still God’s creatures, still connected to God somehow. The mark can be seen as a mythic expression of something we Orthodox believe: the image of God in man was seriously tainted by the sin of Adam and Eve, but it was not destroyed. It was the remnant of the image that allowed human history to proceed under the watchful eye and guidance of God. In a sense, the mark of Cain is the mark of humanity: fallen but not totally destroyed. Cain’s cynical question – “Am I my brother’s keeper?” – is the question that undergirds every religion and philosophy that humans have looked to for guidance. Categories: Lenten Reflections | Tags: Cain and Abel, east of eden, offerings to God, original sin, the first murder, Yahwist | Permalink.